New iPhone apps are in always development, so even more apps that could fit your needs will be available. Still, to get you exploring what’s possible, here’s a quick list of apps that might whet your appetite. Access the App Store by tapping the App Store icon on the Home screen. You can start by exploring the Featured or Top Choices categories (see the buttons along the bottom of the screen). Or you can tap Explore and find apps divided into categories. Tap an app to see more information about it. 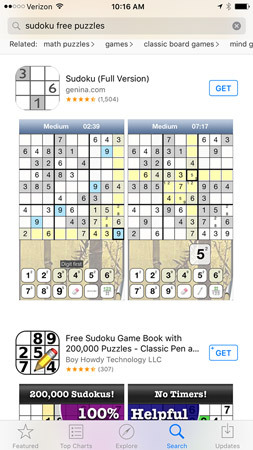 Sudoku2 (free): If you like this mental logic puzzle in print, try it out on your iPhone. It has three lessons and several levels ranging from easiest to nightmare, making it a great way to make time fly by in a doctor’s or dentist’s waiting room. StockWatch Portfolio Tracking and Stock Market Quotes ($1.99): Even though there’s a Stocks app on the iPhone Home screen, this app will help you keep track of your investments in a portfolio format. You can use the app to create a watch list and record your stock performance. SpaceEffect (free): If you need a photo-sharing service with some cool features, try SpaceEffect. You can not only upload and share photos but also apply awesome effects to them. Paint Studio ($3.99): Get creative! You can use this powerful app to draw, add color, and even create special effects. Virtuoso Piano Free 3 (free): If you love to make music, you’ll love this app, which gives you a virtual piano keyboard to play and compose on the fly. Travelzoo (free): Get great deals on hotels, airfare, rental cars, entertainment, and more. This app also offers tips from travel experts. Nike+ Training Club (free): Use this handy utility to help design personalized workouts, see step-by-step instructions to help you learn new exercises, and watch video demonstrations. The reward system in this app may just keep you going toward your workout goals. Note that you can work on documents using apps in the cloud. Use Keynote, Numbers, Pages, and more apps to get your work done from any device.